Church leaders have long voiced fears that Christian communities may be dying out in the land where Jesus was born, lived and died. Conflict, lack of economic opportunities and the pull of the West have been driving a steady haemorrhaging of Christians for several decades, while low birth rates ensure that those who stay live as ever-shrinking minorities. Although few reliable statistics exist, there is little doubt that the exodus has accelerated throughout the recent Palestinian intifada. "In my neighbourhood, where I was raised, most of my neighbours are in the United States, and Europe. They just left," said Nashat Fellemon, director of the Palestinian Bible Society, who lives in East Jerusalem. The causes of emigration are complex. "Christians here are between two fires. We are between the fire of occupation and discrimination by the state of Israel - and the fire of living in a community where the majority are Muslims," said Mr Fellemon. The economic pain experienced by Christians and Muslims alike in the West Bank and Gaza is a powerful pressure. Curfews, closures, soaring unemployment, plunging tourist numbers and, at times, fighting in the streets, have taken a heavy toll. 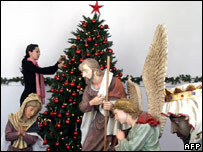 Palestinian Christians have a long history of moving to countries as far flung as the USA, Chile and Australia. Having family members abroad makes emigration easier for them. But with the increase of the role of Islamic militancy in the Palestinians' struggle, Christian-Muslim relations are also playing a part. Many Palestinians, including Christians, stress that the two religious communities have lived in peace for centuries, that they are partners in the Palestinian struggle for nationhood and that tensions are few and far between. But some Palestinian Christians speak of threats, difficulties buying land, arson attacks, Muslim men taking advantage of Christian women and a general sense of feeling pushed out. Mr Fellemon says a Bible Society Building in Ramallah was recently torched - although this is the first such incident the organisation has faced and he does not know who was responsible. The scale of such persecutions is a highly sensitive issue. Incidents are well publicised by supporters of Israel, while some Palestinians may be playing them down. A detailed study published in November 2005 by Israeli judge Justus Reid Weiner painted a picture of extortion, rapes, forced marriages, heavy discrimination and, in the case of one Muslim convert to Christianity, murder. But Bassem Eid, director of the Palestinian Human Rights Monitoring Group says research attempts by his organisation have not thrown up a similar volume or severity of testimonies. "I don't think it is a big problem, but I can sense that there is some sort of problem," he said. The group does, however, support the widespread accusation that Islamic militants specifically chose Christian homes as firing posts during fighting near Bethlehem in 2002. "The belief of Islamic extremists that Westerners sympathize more with Christian suffering has led some militants to initiate shooting from Christian areas like Beit Jala, in order to force an Israeli reprisal," the group wrote in a 2004 report. For Mr Eid, a Muslim, the root of the problem is "the lack of a culture of minority rights" in the Palestinian territories. "Muslims believe in resistance - and Christians also do, but in a non-violent way. We know they are less violent than the Muslims. It seems we are not giving the Christians the opportunity to express their opinion," he says. "It makes me sad that they are suffering from their Palestinian brothers, as well as from the occupation." Israel also has a sizeable Christian population - mainly made up of Israeli Arabs, but with increasing numbers of immigrants from around the world. But again, low birth rates and emigration mean the Christian population has dropped from 2.8% of Israel's population in 1949 to only 2.1% in 2004. As a minority within a minority, Israeli-Arab Christians suffer the same well documented discrimination in terms of education, employment and public services that other Israeli-Arabs face, as well as struggling to maintain their cultural identity. Although relations with Muslim Israeli-Arabs are generally peaceful, there are points of tension, such as a long-running battle over the building of a mosque overlooking the Church of the Annunciation in the town of Nazareth. 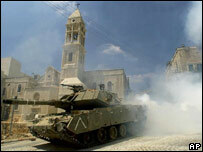 In the West Bank and Israel alike, churches range from Greek Orthodox and Armenian to Catholic and protestant groups. But morale is undermined further by the long history of fractious - at times downright hostile - relationships between denominations. 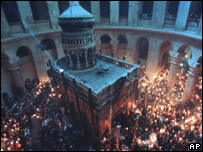 In Israel there are also congregations of Messianic Jews, Jews who believe that Jesus is the Messiah. And the mix is further complicated by a small but vocal community of Christian Zionists - Christians who support Israel passionately, believe that its creation was the fulfilment of a biblical promise and oppose the surrender of any occupied territory. And, particularly around major festivals, Christians from around the world flock to the region to see for themselves the land where Jesus walked. While some analysts make dire predictions of few Christians left by 2025, others argue that the church is highly unlikely to die out in the Holy Land. Mr Fellemon believes that, if church leaders educate and equip young people properly, "there is hope", but unless they act fast, future visitors may see only the "dead stones" of churches-turned-museums. "If I am a Christian living abroad and I want to come and visit the Holy Land, I don't just want to see dead stones, I want to see living stones," he said. Are you a Christian living in the Middle East?